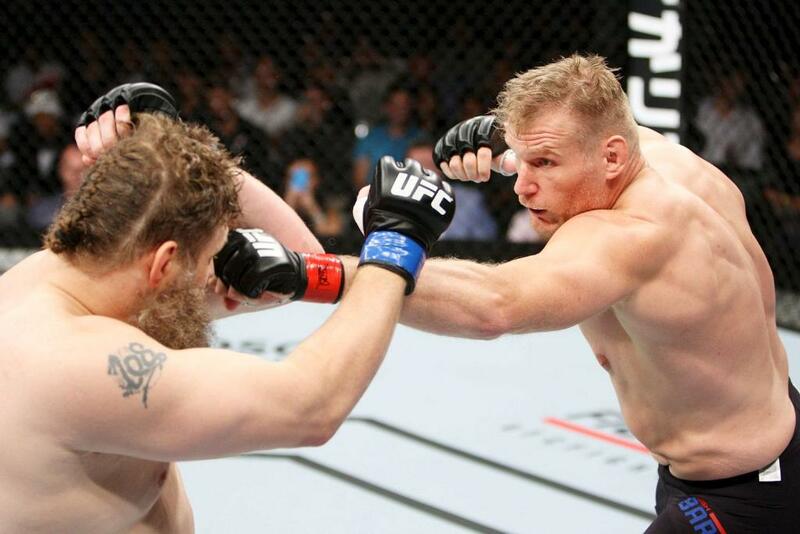 Josh Barnett was triumphant in his return to the Octagon, and to the Land of the Rising Sun, as "The Warmaster" outworked Roy Nelson for a hard-fought unanimous decision victory at UFC Fight Night 75. Neither Heavyweight wanted the bout to go the distance; but their resolve cancelled each other out. "Big Country" took plenty of punishment, but managed to last it out and even caught his compatriot with a handful of big strikes. While Barnett is well-known for his submission acumen, he found himself on his back in the early stages of the first round at the hands of a swift single-leg takedown. That wouldn't spare Nelson, however, from a lot of punishment to the midsection—as Barnett utilised the clinch to land knees to the body. It wasn't just those types of strikes coming against the fence, either. He mixed it up with elbows and some tough punches to really make it hard for Nelson. Still, that wasn't enough to put him away—this became the first fight where Roy Nelson had fought for more than three rounds. On more than one occasion, "Big Country" was in trouble—at the receiving end of some big shots. But nothing phased him, and even Barnett was frustrated, he just couldn't put him away. We even got to see a few overhand rights connect, not as cleanly as desired though or it would've been lights out on the other side. All in all, Barnett went on to win over a five round complete performance. He worked hard for it, and it was a good resurging point as he looks to get back into the top of the mix in the stacked heavyweight division. Nelson is really on a skid now, but he's far from done, few can put him away. Respect was clear between the two combatants after—with Barnett calling him a true "champion". In the co-main event, Uriah Hall got the biggest win of his career in one of the biggest upsets of the year as he dispatched Gegard Mousasi with a stunning second-round knockout. Aware of the standup threat posed by Hall, Mousasi looked to take the fight to the mat in the first round and it proved to be one of the more entertaining ground battles in the Octagon. The American demonstrated fantastic submission defence as he fought of an arm-triangle and rear-naked choke, making it out of the first round with his hopes in tact. Mousasi looked to do the same in the second frame, but in the standup he would be caught by an incredible spinning back kick, landing flush to the head, wobbling him before following up with a knee and vicious strikes on the ground leading the referee to end it in favour of Hall. Two Japanese fighters operating in the lower weight classes of the organization got important unanimous decision victories to bounce back in fine form earlier in the main card. Kyoji Horiguchi—coming off a late submission loss in his title fight with Demetrious Johnson—put on a clinic to defeat Chico Camus on points with his speed and striking uncontainable. Takeya Mizugaki handed George Roop his second straight loss before that in a routine victory. Diego Brandao also blitzed past Katsunori Kikuno in just 28 seconds, using a range of knees and punches to get the job done in no time at all making up a night to remember in East Asia.